Conveniently refill your bird feeder and store your seed at once using the More Birds SureFill 3 in 1 Super Tote. 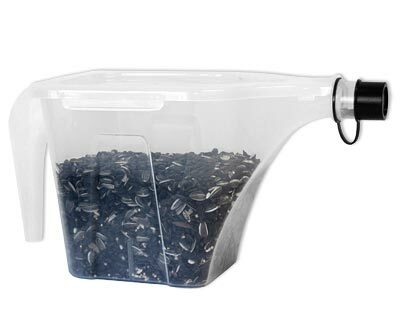 This durable, clear plastic vessel not only makes it simple to refill your bird feeders; it also is easy to transport and stores plenty of seed. The center chamber holds up to 3.5 quarts or 5 pounds of seed, and its square shape forms a stable and streamlined piece. The attached lid snaps closed, ensuring the feed remains fresh, and a handle on the back of the tote makes it simple to carry to your feeder. The front spout inserts into the top of your existing bird feeder, and its 1" diameter opening ensures quick filling. A plastic cap covers this spout when not in use, creating an air tight seal on the item. Keep bird seed fresh and easily refill your feeders with this SureFill 3 in 1 Super Tote.